MADRID (AP) — With Real Madrid and Barcelona faltering, the Spanish league is wide open. For the first time in nearly two decades, only 10 points separate the leaders and the last-place team after seven matches. Not since the 1999-2000 season was the gap so small. At the top, only three points separate the first seven teams, and five points are between the top 11 clubs in the 20-team standings. Barcelona hasn’t won in three straight league matches, while Real Madrid hasn’t won in two consecutive, allowing the rest of the field to catch up. Sevilla is only one point off the lead, while Atletico Madrid is two points back. Both teams have a chance to take over the lead this weekend in home games while Barcelona and Real Madrid face difficult away matches, against Valencia and Alaves, respectively. In the last 14 seasons, Barcelona and Real Madrid only failed to win the league title once. Atletico won in 2014. It’s tight at the bottom of the table as well with six teams within three points of each other, including promoted clubs Huesca and Rayo Vallecano. Despite a difficult match at Valencia on Sunday, there is good reason to believe Barcelona is on track to recovering in the league. 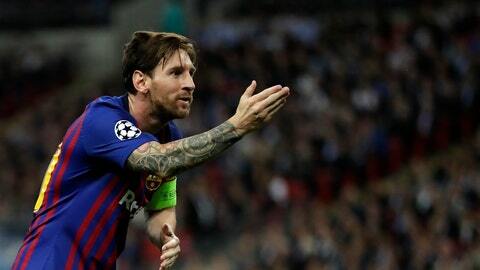 After subpar performances, Lionel Messi and his teammates outclassed Tottenham 4-2 at Wembley Stadium in the Champions League on Wednesday. Messi scored twice and the victory helped Barcelona regain much of the confidence it had lost in its Spanish league setbacks. The defense will remain a concern, though, because the team has conceded seven goals in its last four games in all competitions. It’s been a tough run for Real Madrid midfielder Luka Modric since leading Croatia to the World Cup final and being named best player of the year. Modric hasn’t regained his best form and has yet to win in three matches since being voted best in the world. He was a second-half substitute in Real Madrid’s 1-0 loss at CSKA Moscow in the Champions League on Tuesday, a result that kept the team winless in three matches in all competitions. Madrid was coming off a scoreless home draw in the league derby against Atletico Madrid and a 3-0 loss at Sevilla. Since returning from the World Cup, Modric has been rested in several matches by Madrid coach Julen Lopetegui. Atletico Madrid has an Antoine Griezmann boosted by a two-goal performance in the team’s 3-1 Champions League win over Club Brugge on Wednesday, but it will likely host Real Betis without Diego Costa because of an injury. Costa had to be replaced after setting up Griezmann’s second goal at Wanda Metropolitano Stadium. The team has yet to say how long he will be sidelined, but the problem has already cost the striker a place in Spain’s national team for its upcoming matches. Defender Jose Maria Gimenez also left the match because of an injury and is doubtful for Sunday’s game. Atletico coach Diego Simeone seemed confident Griezmann can make up for Costa’s absence in attack.